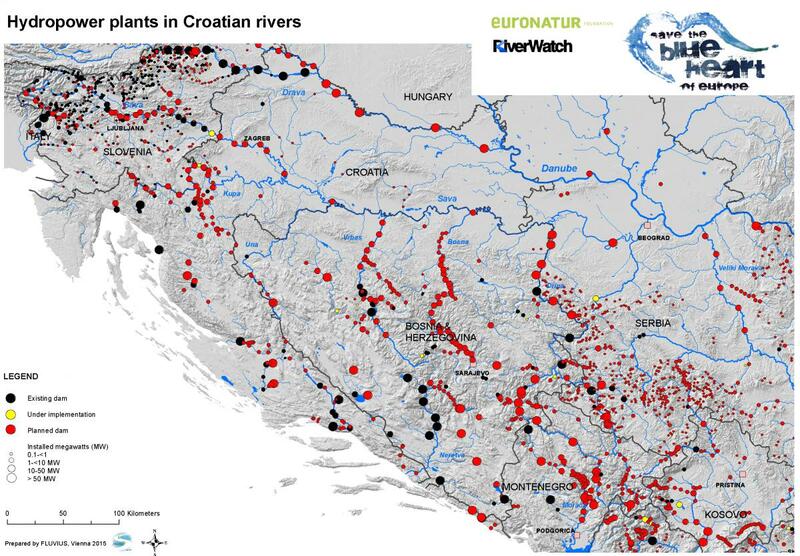 The Eco-Masterplan for Balkan Rivers is a comprehensive study which, for the first time, combines knowledge about biodiversity (fish, mussels, caddisflies), integrity of rivers and floodplains (hydromorphology), as well as the location of protected areas. A river network of over 80,000 kilometers in length was scientifically assessed according to these criteria. The result: about 61,000 kilometers of river (76 percent) are of high ecological quality and therefore designated as No-go zones for hydropower expansion. 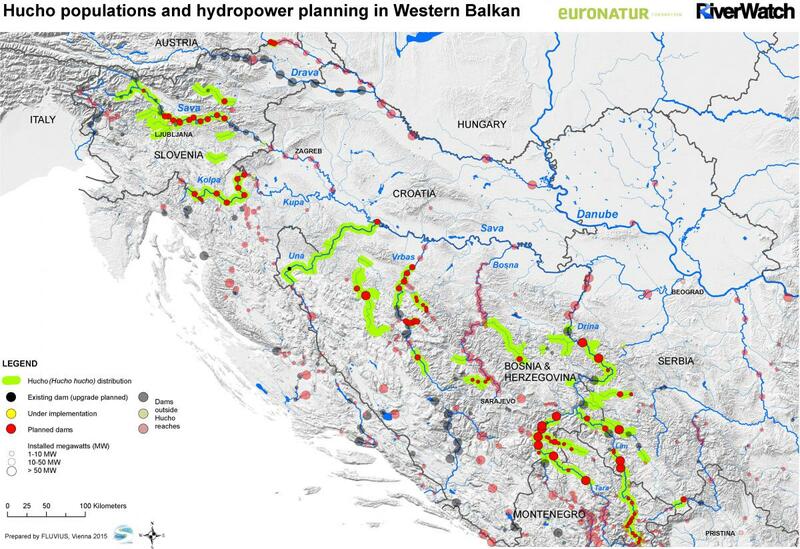 An energy study included in the Eco-Masterplan shows that the hydropower projects currently foreseen in the Balkans could be easily substituted by the other sources of renewable energy, particularly solar and wind. All this data is shown in graphs and maps. The Eco-Masterplan is a suitable tool to curb the devastating plans for hydropower expansion in the Balkans, to preserve biodiversity and beauty of these river landscapes, to avoid social conflicts and to increase planning security for investors. The countries in the Balkans are facing a dilemma: they must fulfill the EU renewable targets while also follow environmental legislation. 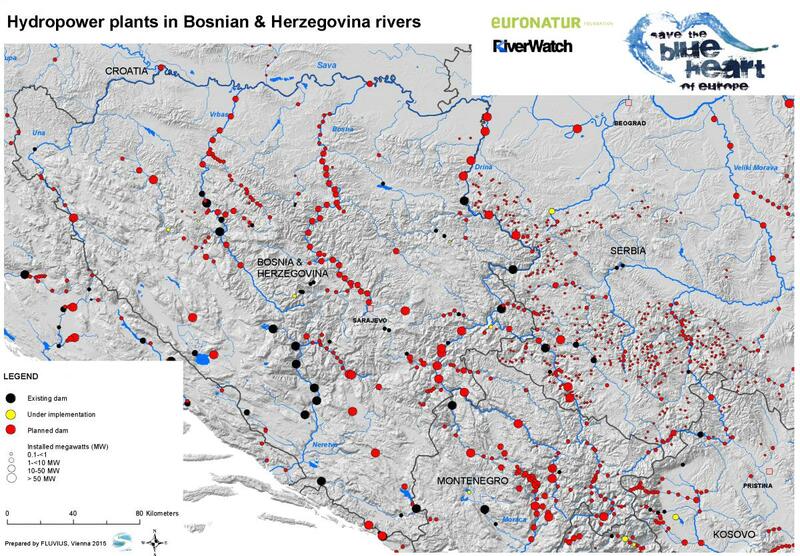 This raises the question: Is it possible to increase the renewable energy share AND keep the Balkan Rivers alive? We commissioned the energy expert Dr. Jürgen Neubarth with this question and his study “The role of hydropower in selected South-East European countries” shows that it is possible. The potential of environmentally much sounder sources of energy, such as wind and solar, is up to twice as high as the current electricity demand in the sun-kissed Balkan countries and exceeds the potential from hydropower by about five times! Thus, there is actually no need for new hydropower development. Moreover, most Balkan countries would still fail to reach their renewable targets even if all economically feasible hydropower plants were built, including in protected areas like national parks. Thus, a complete switch in the energy policy is needed. The data sows that this is possible. More than 60 scientists from Albania, Austria and Germany have collected their knowledge about the biodiversity and ecology of the Vjosa and published it on 385 pages in this volume. 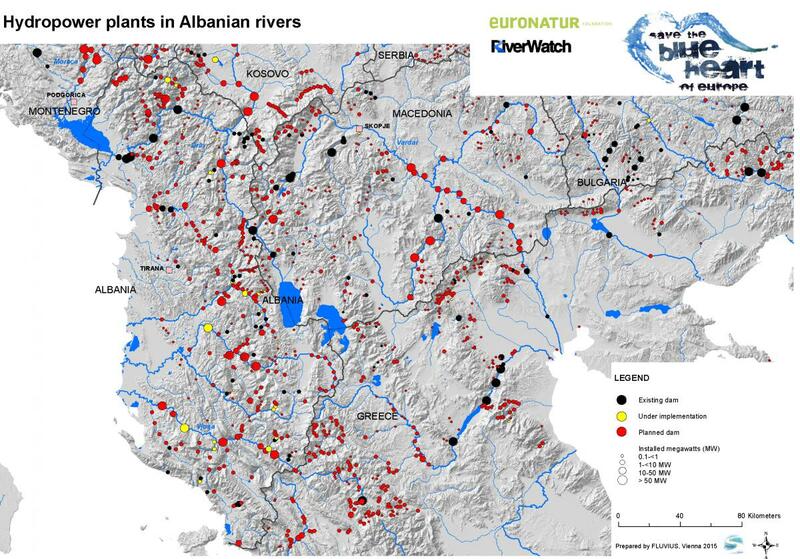 Vjosa in Albania is the last large wild river in Europe outside Russia, free-flowing on a course of over 260 km without significant technical obstacles. As such, the Vjosa can serve as an invaluable reference system for future renaturation projects. In the rest of Europe such natural conditions have long gone and knowledge of how natural rivers look like and function is lost. Surprisingly, the Vjosa and their tributaries are still largely unexplored. The scientists from the three countries have joined forces to change that, to provide argumentation for the preservation of the Vjosa and against the plans of the Albanian government to build Vjosa hydroelectric power plants. 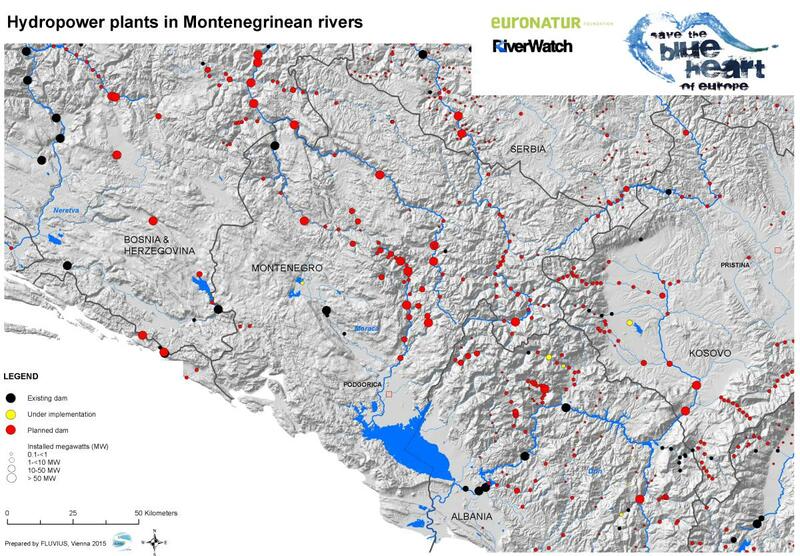 This study proves that the rivers in the Balkans constitute Europe’s fish sanctuary: 113 endangered fish species find habitat in the rivers between Slovenia and Greece – more than in any other region in Europe. 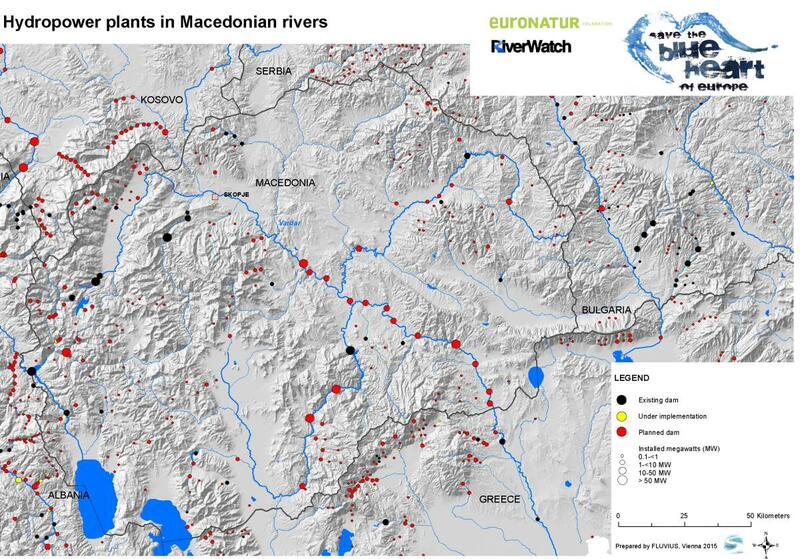 Fish expert Dr. Steven Weiss from the University of Gras and his co-authors also assessed the consequences for the fish fauna, if the projected hydropower plants in the Balkans were to be constructed. The result is alarming: up to 49 freshwater fish species are faced with either the threat of extinction or loss of between 50 and 100% of their Balkan distribution. Of these, eleven endemic species are threatened with extinction, seven will become critically endangered, and the number of endangered species will double to twenty-four. For 68 of 69 endemic species, habitat losses are estimated between 30 and 100%, resulting in increased levels of endangerment for essentially the entire endemic fauna. Additionally, the four migratory sturgeon species would essentially lose their potential for rehabilitation in the lower Danube if additional dams were constructed there. 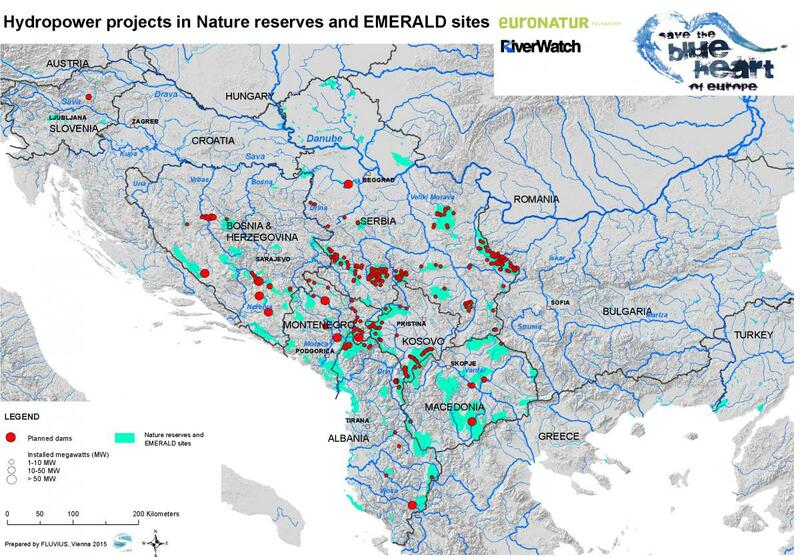 As the 2015 Bankwatch study “Financing for hydropower in protected areas in Southeast Europe” (see further down) shows, international commercial and public banks have been bankrolling a wave of hydropower projects across southeast Europe that have damaged pristine rivers, including in protected areas. This 2018 update finds that the number of financed hydropower projects in the region is even greater than previously known. These include the European Bank for Reconstruction and Development (EBRD), the EU’s house bank the European Investment Bank (EIB), the World Bank Group and commercial banks such as Austria’s Erste Bank and Italy’s Unicredit Group. 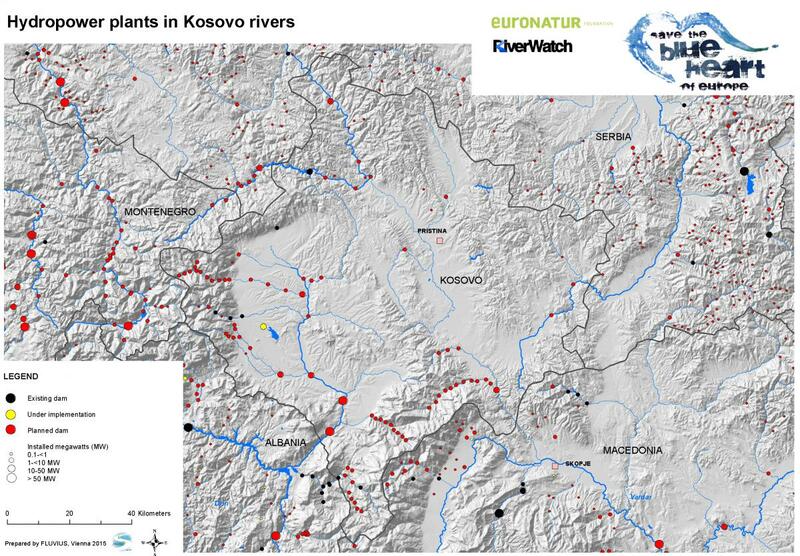 Within the context of the Blue Heart of Europe campaign, the NGO Bankwatch visited eight recently constructed small hydropower plants in Albania, Macedonia and Croatia. All of them were financed by the European Bank for Reconstruction and Development (EBRD) and the European Investment Bank (EIB). In a nutshell, the projects have damaged biodiversity and are in urgent need of increased monitoring and restoration measures. All findings are published in this Bankwatch report. If you always wanted to know whether 'small' is actually 'beautiful' when it comes to hydropower, find out the truth in this study. The Sava is one of the most interesting and complex rivers in Europe. Along its course of 926 kilometres, the Sava features the entire spectrum of different rivers habitats. Together with tributaries, the Sava basin constitutes one of the best preserved and most diverse river systems in Europe. Unfortunately, like so many other European rivers, the Sava stands at a crossroad: on the one hand improving the ecological condition of water bodies is a clearly defined goal of the European Union. On the other hand, flood protection, recreational use and transport capacities, etc. are to be increased as well. Moreover, hydropower developments, sediment exploitation and navigation upgrades put further strain on the river. In which direction is the Sava going? This is the very question we asked ourselves within the context of the “Save the Blue Heart of Europe” campaign. Our answer is this White Book. It shall serve as an extensive and comprehensive overview of the situation of the Sava. However, what makes this White Book truly unique is that it is the first study offering suggestions for area-specific ecological flood control and river restoration projects. In other words, we show where former alluvial areas could be naturally flooded once again and in which sections the Sava’s river bed should be given more space. Southeast Europe is experiencing a wave of hydropower projects. 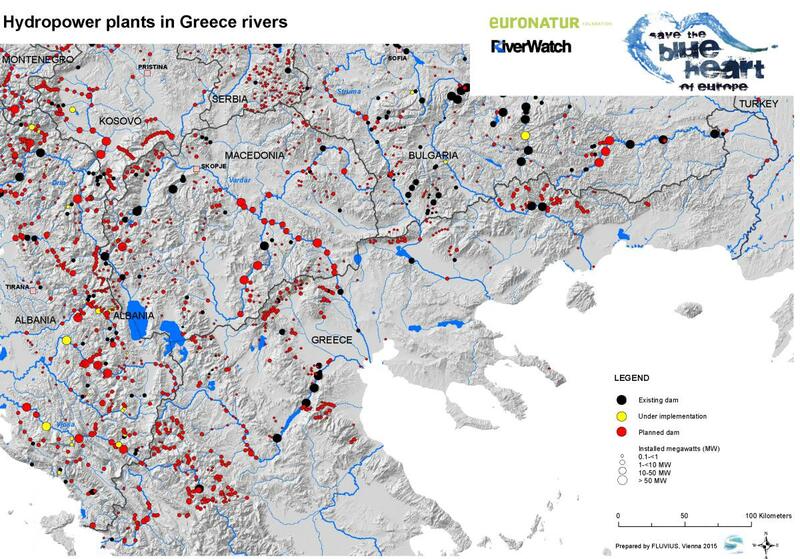 In a region with a deadly combination of Europe's last wild rivers, rampant corruption and inadequate nature protection, the potential for damage is immense. 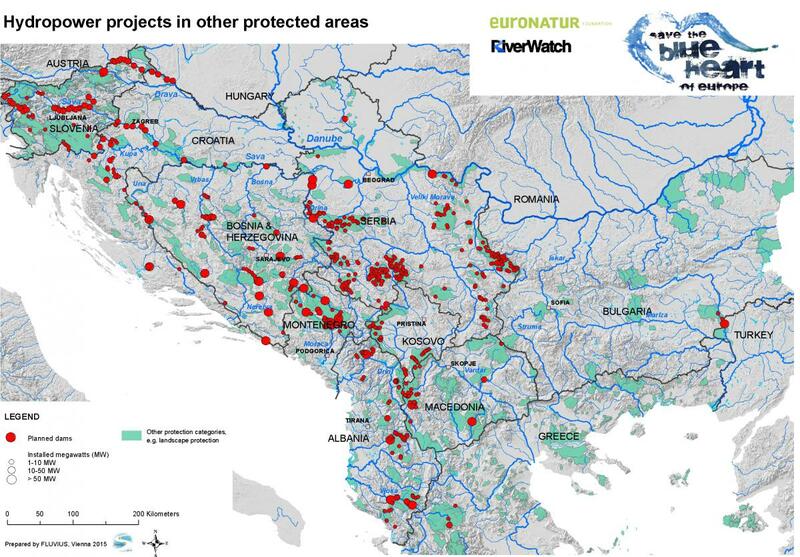 A recent study by Dr Ulrich Schwarz (see study "Hydropower Projects in Protected Areas on the Balkans" below) found that almost half of the planned projects are in protected areas. This research aims - to the extent possible given the secrecy around the financial sector - who are the main actors involved in financing hydropower projects in the region, both overall and inside of protected areas. The extensive analysis shows that multilateral development banks are playing a key role. The European Bank for Reconstruction and Development (EBRD), the European Investment Bank (EIB), and the World Bank's International Finance Corporation (IFC) have extended loans totalling EUR 818 million to no less than 75 hydropower projects, including 30 directly affecting protected areas like national parks, Natura 2000 sites, and Ramsar sites. !!! Update January 2017 !!! The EBRD has said that financing has been cancelled for four small hydropower plants in Macedonia: Zrnovska reka 1, Zrnovska reka 2, Estericka reka, Kadina reka. In addition, financing has been cancelled for the 68 MW Boskov Most plant in the Mavrovo National Park, also in Macedonia. Regarding the Ternove SHPP in Albania, the EBRD has said that it had conducted an on-site investigation into the concerns received in a letter from an affected citizen. The bank found nothing to substantiate the allegations. Bankwatch will continue to monitor the issue. In a follow-up study of the initial "Hydromorphological Status and Dam Projects" study from 2012 (U. Schwarz), we included small hydropower plants as well, when previously only those over 1 MW were recorded. A total of 2,683 future hydropower projects have been recorded on the Balkan Peninsula. Additionally, 714 existing dams were found in this region. Based on four size categories the 2,683 planned HPPs are distributed as follows: 68 very large projects (> 50 MW), 178 large projects (10-50 MW), 867 medium projects (1-<10 MW) and 1,570 small projects (0.1-< 1 MW) were identified. 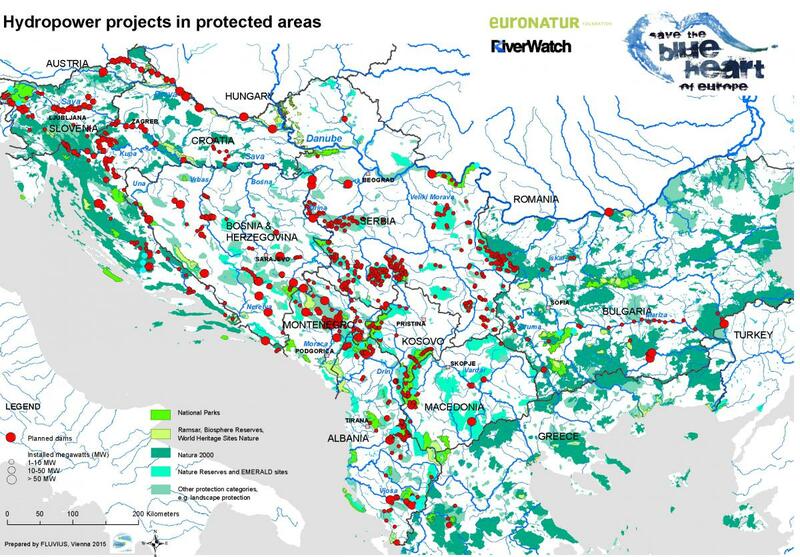 This study aims to quantify the number of hydropower projects that are planned within protected areas on the Balkan Peninsula. A total of 1,640 projected hydropower plants (HPPs) have been examined based on a detailed and categorized network of protected areas. A total of 535 planned projects or 32 % fall in strictly protected areas. In addition, 282 HPPs (17 %) are projected inside other protected areas with a weaker protection status. Altogether, 817 or 49% of all projected HPPs fall in protected areas, which points to the fact that this practice is the rule rather than an exception. This indicates a very high pressure of hydropower on protected sites. The Huchen or Danube Salmon is one of the most enigmatic species of Europe's freshwater fauna. 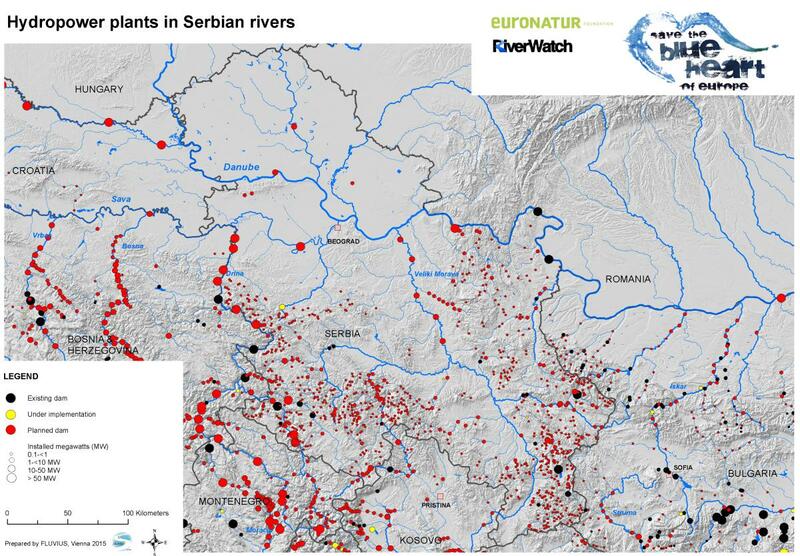 It is a sensitive indicator species for some of the most ecologically valuable rivers in the Danube drainage. Historically, the species was wide-spread across the entire Danube basin. Since the late 19th century, however, Huchen populations declined by two thirds and the remaining populations are now highly endangered by hydropower development. But knowledge on the distribution of the Huchen on the Balkan Peninsula has been incomplete. 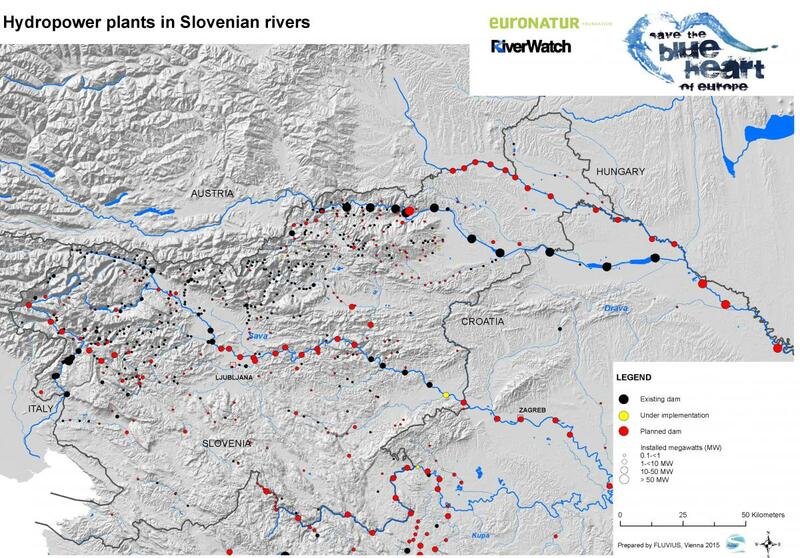 Within the context of the international campaign “Save the Blue Heart of Europe”, 18 scientists from 7 countries explored for the first time, in which rivers between Slovenia and Montenegro the Huchen can still be found. 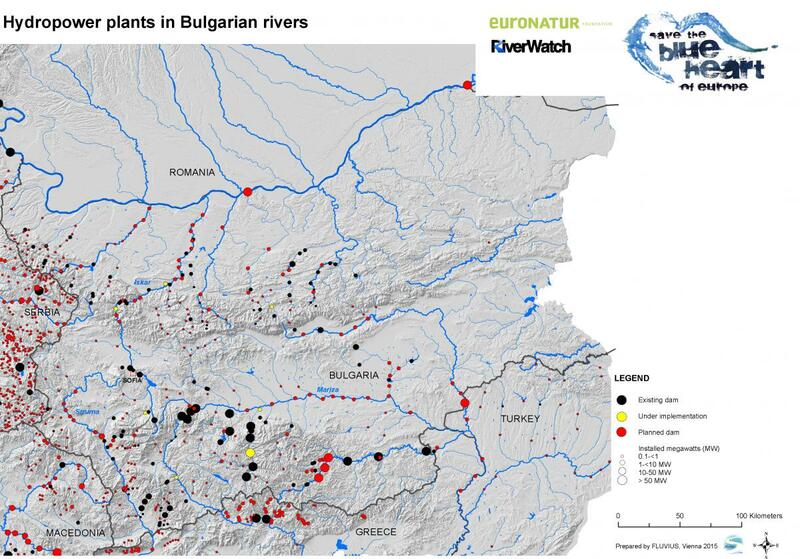 The results clearly show that the Balkan rivers constitute the last big hot spot for this species. Self-sustaining populations of Huchen were found in 43 rivers with a total length of 1,842 kilometres. This corresponds to 65 percent of all known Huchen stretches worldwide. However, 93 hydropower plants are projected directly in stretches with healthy Huchen populations. Experts predict a population decline of up to 70%, if these dams become reality. The compliance with EU legislation and guidelines of all hydropower projects inside the Mavrovo National Park in Macedonia was analyzed by the Ökobüro - an environmental alliance based in Austria. Legal experts conclude that the projects strongly violate EU law. Particularly alarming is the lack of environmental data leading to false and misleading environmental assessments. Another important aspect is that the cumulative effects of several projects planned in the area (a total of 22 hydropower facilities!) would have had to be considered before even starting project permitting procedures. This was not the case. 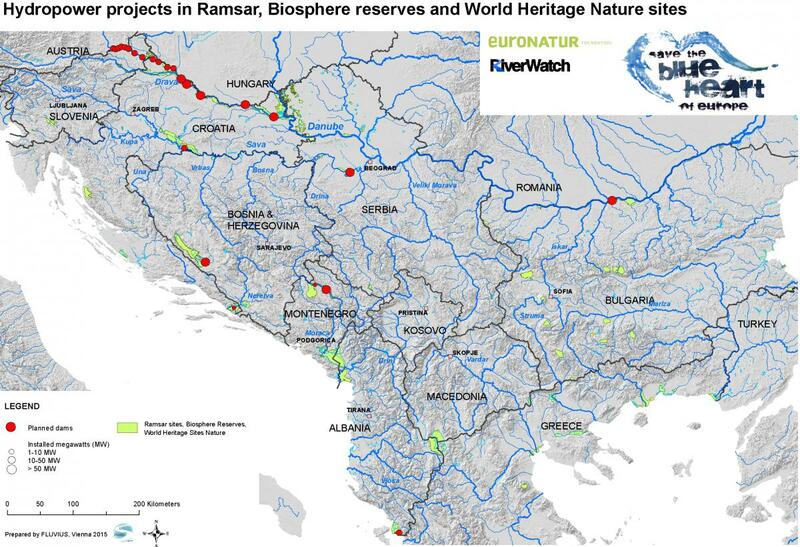 In preparation for this campaign, the hydromorphology (the structural intactness of the river) of about 35,000 river kilometers on the Balkan Peninsula has been assessed. 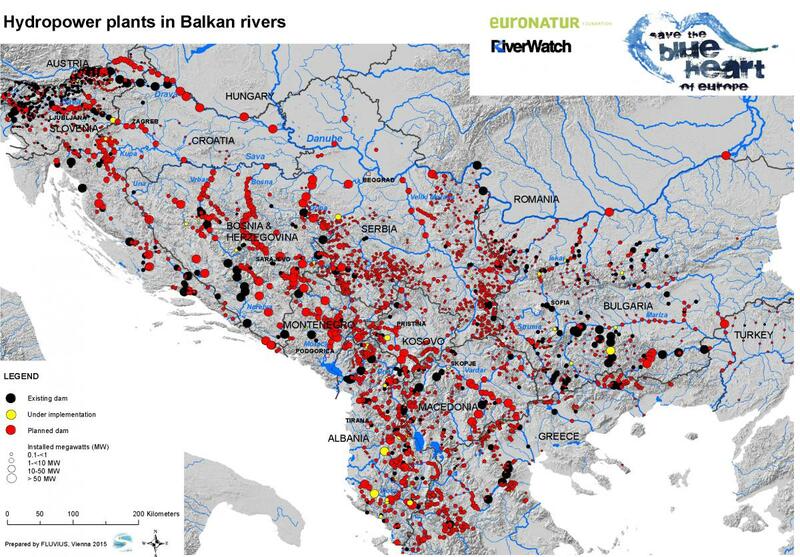 The results were impressive: 30% of the Balkan rivers are in a pristine state, another 50% are in a good condition or only moderately modified. In other words, almost 80% of 35,000 river kilometres are in a very good, good or acceptable morphological condition. That is the highest percentage in all of Europe. An extensive research was also done on the proposed and planned dam projects in the Balkan region. The Balkan region is Noah’s Ark for Europe. Europe’s fly fishers have known it all along, but now there is scientific proof: the Balkan region is the most important hotspot for threatened fish species in Europe. This is also true for freshwater bivalves and freshwater snails. 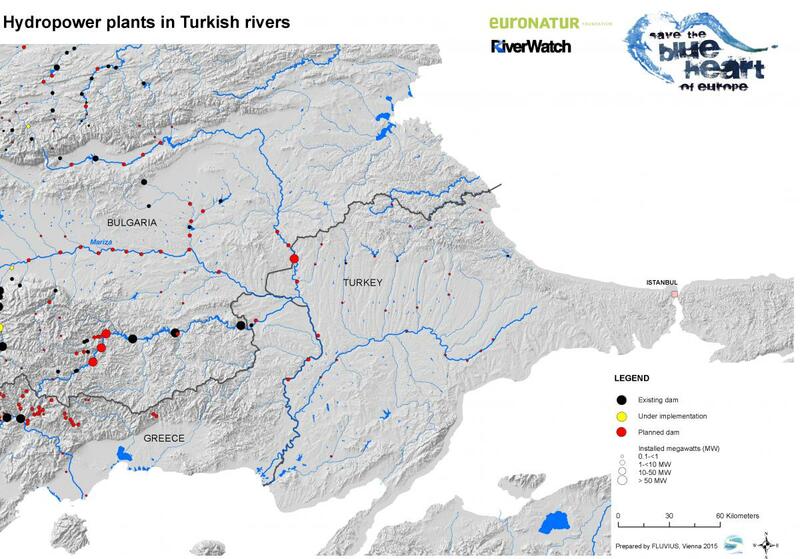 In his study, renowned fish expert Dr Jörg Freyhof verified the importance of Balkan rivers for Europe’s fauna. 69 fish species can only be found in the Balkan region (endemic types). 28% of endangered freshwater fish species find habitat in these rivers. The percentage is even higher in regards to bivalves and snails: over 40% of all endangered mollusc species in Europe can be found here. Here is another fact: if the dams are being built, underwater biodiversity will be reduced drastically. 75% of all fish species and 70% of bivalves and snails would not be able to adapt to the new environment and would either die or decrease significantly in numbers.